Mobile manufacturer Nokia now released new Windows based smartphone on Lumia series, named as Nokia Lumia 720. This smartphone currently sported online for Rs. 18,500. Nokia launched Lumia 920 few days ago. 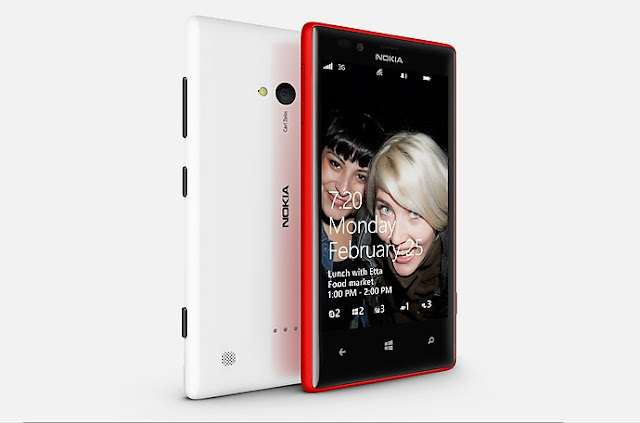 Lumia 920 is also a windows loaded smartphone with Pure view camera and clear black display. Nokia Lumia 720 come with 4.3 inch LCD capacitive Multi touch ClearBlack display with IPS technology and 480 x 800 pixel resolution. It pre-loaded with Microsoft Windows phone 8 operating system and built in with 1.0 GHz Dual-core Qualcomm Snapdragon™ S4 processor that mounted on Qualcomm MSM8227 chipset. It has 512 MB of RAM and 8 GB of internal storage space, that expandable up to 64 GB via MicroSD card slot. Company also offer 7 GB free cloud storage space and online retailers offers 16 GB SanDisk memory card to user when they pre-order the smartphone. Lumia 720 features connectivity options through EDGE, GPRS, Wi-Fi, Bluetooth, NFC, 3G, Micro USB, GPS, and 3.5 mm Audio Jack. This Smart phone come with Dual cameras, 6.7 MP rear facing auto focus camera with Flash light and 1.3 MegaPixel front camera with video call facility. Cameras equipped with image capturing and video recording facilities. The smartphone powered by a 2000 mAh Li-Ion battery it give 520 hrs standby time, 13.4 hrs Talk Time on 3G network and 23.4 hrs Talk Time on 2G network, and 79 hrs music playback time. Battery is not removable and wireless charging feature enabled.